Looking for a quick getaway in Mulshi for a summer weekend? We found not one, but five amazing resorts that are totally worth your time. A picturesque cottage resort amidst lush green surrounding, quaint ponds and clear lakes, Jalsrushti in Mulshi, is almost like a dream come true. The resort has 14 spacious cottages against the backdrop of lemon and strawberry gardens. Eight of these cottages (Jalshup) are fully wooden and overlook a calm blue river, while the rest (Jalaka) are well appointed and have a mesmerising pond view. We hear you can take a rickety bullock cart ride across the property and even request for a bonfire at the front yard for a perfect candle light dinner with your partner. The prices start at INR 10,700 onwards (per night). Located at Girivan in Mulshi, 45km from Pune, Dhepe Wada is a one-of-a-kind heritage staycation designed to experience the 350-year-old Maharashtrian wada culture in all its elegance and glory. The place houses 11 rooms that overlook a beautiful landscape. Each room boasts of antique wooden doors, arched windows, teak-wood furniture and glass lanterns. The main hall known as Diwankhana adorns seven massive wooden columns and a carved roof resplendent with intricate architectural designs. There is also a five-fold square or a chowk, designed for playing traditional games such zimma, fugdi, mangalagauri, khamb- khamb khamboli and more. We hear the kitchen, too, is pretty old-school and has a chulha, wood-burning kitchen stove, a jate, which is an erstwhile mixer-grinder and a ukhal – an old way of churning out butter using a rumbler. For all your water supply, there is a well! For a single occupancy room, the price is INR 4,000 per person. For double occupancy, the charges are INR 5,200 per person. 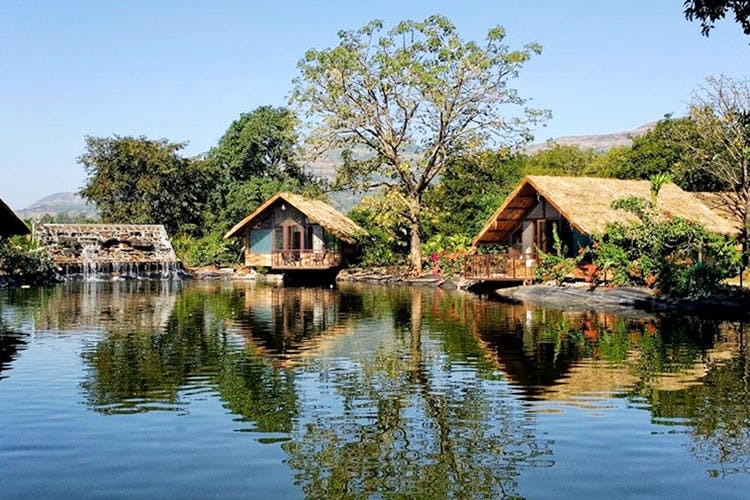 Malhar Machi is a gorgeous mountain resort with a beautiful view of the Sahyadri Hills and the Mulshi Lake. Perfect for a quick and comfortable stay over the weekends, this place also offers horse riding, a spa treatment and a bonfire if requested. They offer four types of cottages: Maharaja, premium, bouganvilla cottages and dormitory. Starting at INR 11,200 for a night, we loved their bouganvilla cottages, despite being tad expensive. Good part though? All the prices are inclusive of taxes and breakfast, lunch, high tea, and dinner. The Basho Bougainvillea in Mulshi is a stunning resort with variety of accommodation options including cottages, tents and our favourite, the pool villas which literally have a pool next to the bed. Every room here has a beautiful view of the Mulshi lake and is equipped with an AC, TV and a mini bar. What’s more? There is a cute library in the resort, in case you want to spend some quality time alone. The rooms are priced between INR 6,500- INR 12,500 (plus taxes) per night and may vary depending on the choice of stay and number of extra people. Started by the Nalanda Prathistan Trust, Avanti Kalagram is a peaceful eco-resort in Mulshi, where you can stay and learn traditional art from the rural craftsmen. We hear the resort conducts various workshops on pottery, batik painting and more. If you’re in for some adventure, you must sign up for rappelling, zip lining and rafting. As we mentioned earlier, the stay is quite decent and extremely budget-friendly. For a deluxe room with AC, the price starts at INR 2,900 per night and for a simple dorm room you just need to pay INR 1,500 for a night.